We are dedicated here at Stockopedia to creating the kind of tools that our subscribers need to make better decisions in the markets. 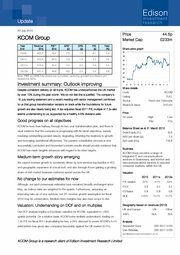 But in our dedication to generate the best toolkit for smart investors to discover and analyse stocks we had to put our portfolio ambitions on hold… until now! We have added support for multiple portfolio currencies. At the moment we are providing GBP, EUR and USD currency support but can add more on request. This sets the reporting currency for your portfolio and all gains/losses will be reported in this currency. We've added the ability to log all your portfolio history - with transactions in whatever trade currency they were traded in. Many London traded securities are priced in Euros, Dollars, even Norwegian Kroner - so this is an essential feature. The portfolio overview page provides an aggregated view of all the positions in your portfolio. If you run your own dealing account, have an ISA or SIPP you'll always have a cash balance unless you are fully invested. We are pleased to announce that we now provide the ability to log cash deposits and withdrawals to generate a more complete portfolio valuation. For sure many sites provide a pie chart showing your sector allocation - but frankly that's not very helpful. Our allocation report shows you exactly which sectors you are overweighting versus the market, which stocks are below or above target allocations so that you can find your blind spots fast. We've also just added an initial private notes feature - this has been heavily requested by subscribers. 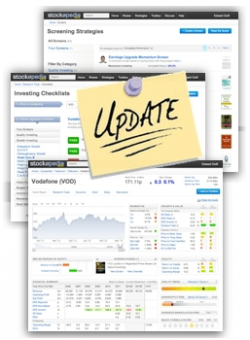 You can add notes to stocks by clicking the 'notes' button on any Stock Report. We'll soon be adding the ability to view these notes directly from watchlists and portfolios as well as adding a general notes landing page. Keep the ideas coming. I will need to study this when I have time. I do not object to improvement but I like to see prospects of success before putting my money in. It is well established that changeing frequently causes loss compared with holding on to good companies, and now I have become wary and weary of advisors. The majority of my stocks are either traded in Canada or the USA so it seems to me that I will not benefit from a system like this (however good it is) until it covers all the exchanges in which I have holdings. If Stockopedia could cater for all my holdings then I would not hesitate to subscribe. I'm sure there are many investors with a similar portfolio to you and I'm sorry we can't cover them yet. We are extending our data coverage to be completely pan-European before the end of this year and aim to add in either North American or Asian stocks next year. Frankly, I'm not willing to stop till we've got the whole globe's securities on this website. Anyone can execute trades on any exchange these days... but there's nowhere you can get the kind of analysis and screening we specialise in for all those exchanges unless you have institutional tools. We'll get there soon enough. Thanks for the update. For me, having these visible on the Watchlist / Folio table view is critical. e.g. So I can put comments such as Buy at 130 and immediately compare this to the price across all stocks.